First, the name "Insanity Racing" is not referring to the nature of motor sport nor anyone involved. The name came about because of how I felt after I purchased a car to get involved in Cross Country motor racing. Having been around off-road & Cross Country motor sport for many years as a spectator and marshal and being in and around the service areas helping out where ever possible, I decided I would like to give running and driving my own car a try. It was while I was driving the UK motorway network with a large rented car transporter/trailer and, on my way to collect the first "Race car" with plenty of time to think , I started questioning what was I doing and why was I doing it? Was this a "mid-life crisis" or was I truly going insane? Thus the name for our new car became "Insanity", shortly thereafter we started calling our little group/team Insanity Racing. The only warning that I will give at this stage to any one else that is thinking of giving this a try is that it becomes addictive. "if I liked driving in cross country motor sport events". Having been on the sidelines for many years I felt I had become familiar with the format and I had started to get to know some of the people. 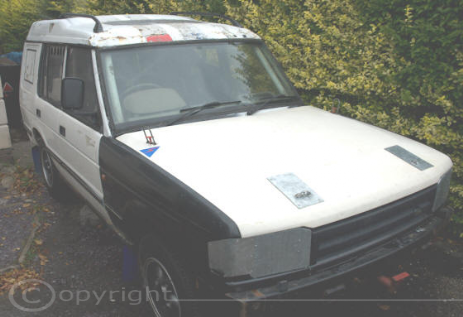 I purchased my first car a Land Rover, Discovery 1 and I went about preparing the car and myself to enter a "British Cross Country Championship" event. At the end of 2011, I entered my first event, joining the last event of the BCCC season at Nescliff, as a clubman entry with the help of a "brave" and experienced navigator. This event proved to be a lot of fun and taught me a lot about both myself, the car and our capabilities, sometimes exceeding both. Later we built a new car. This is us at the 2018 Welsh Hill Rally, held on a very hot weekend at Walters Area south Wales. or you can have a look at the team Facebook page for current updates.